She must have been inspired by the experience. 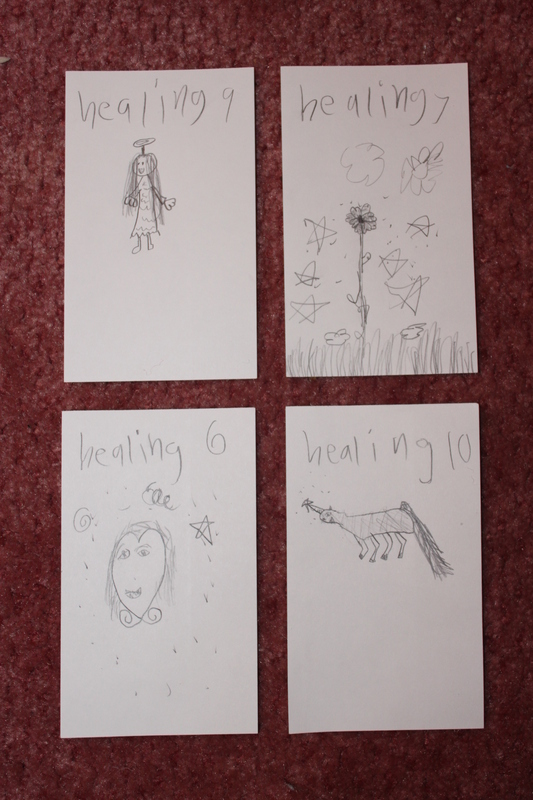 The next morning, instead of watching TV, or even eating much breakfast, she spent two hours making cards for a new game of her own design. “I thought I should practice,” she explained, “just in case I’m a game designer when I grow up.” That’s not a far-fetched notion in her mind, since that’s what her dad does all day long. She enjoys watching my work on Card Hunter, and is constantly asking me questions about how I design games. On her first iteration, there were only five kinds of cards, all attacks: “Sord,” “Bom,” “Dagger,” “Thorns,” and the most powerful “Wild” attack. Each type of card always did a fixed amount of damage and nothing else. But after playing once, she decided to add some variety. The card on the left will do 16 points of damage to another player of your choice (or 18 damage if you’re playing the “Canon” player), and also will do 7 damig (damage) to yourself if you’re unlucky enough to roll a 6 on a standard d6. As you might imagine, Healing Battles takes a long time to play, and mostly devolves into a game of diplomacy, where (for example) you try to convince your sister to gang up on your mom. 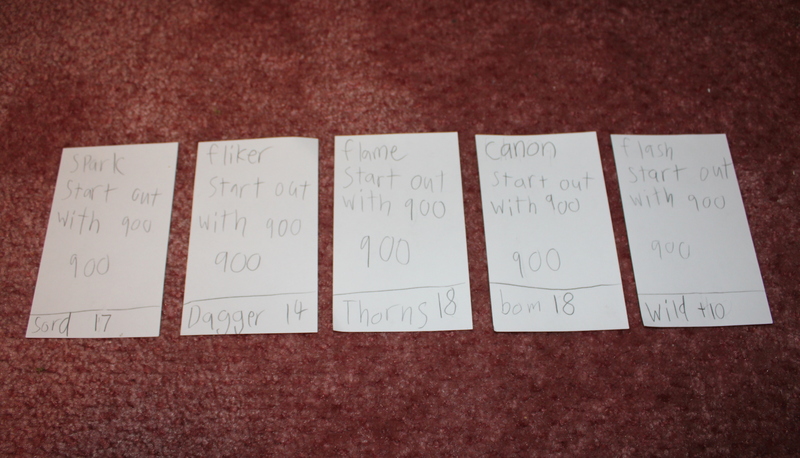 But there are few things in life more exciting for a game-designer parent than watching your kid spend hours writing out cards by hand, excitedly talking about new card ideas, and then begging anyone and everyone to play it with her. It’s also fascinating to see all of her sources of inspiration. 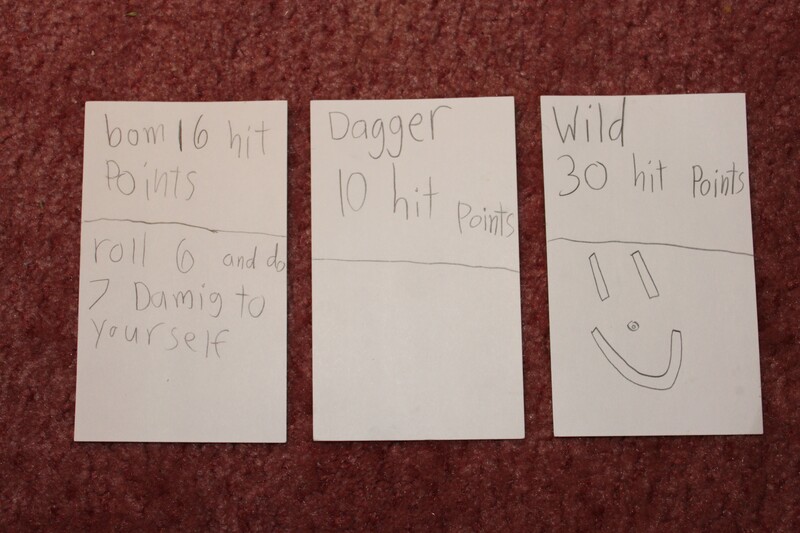 She learned the notions of “hit points” and “damage” from watching grown-ups play D&D, and from Card Hunter. There’s a story on CD she listens to called “Song of the Unicorn,” wherein a unicorn has magical healing powers. And I’m sure the idea of different characters with different powers came at least in part from her favorite board game, Small World. And, as my wife pointed out, Elanor already has a rudimentary notion of game balance. For instance, she has added a new character whose power is adding 1 to every attack and healing card. She knew that the number had to be low, since it affected many more cards than the other characters’ powers. It all makes a dad proud, that’s for sure!